So Monday came and went and my week is well into Tuesday following ECU’s absolute debacle against Temple this past Saturday in Philly. And no, it doesn’t feel less bad. The 49-6 defeat, which marked the first time in what felt like forever that the Pirates failed to score a touchdown, was about as bad as it has been in the Scottie Montgomery era. Aside from ECU’s perfect field goal kicker, there were zero – as in nothing, zilch – positive to take away from the Pirates’ performance in such a no-brainer, critical AAC league match against a team in Temple, that frankly, is decent at best but probably could be tagged as “meh” overall. 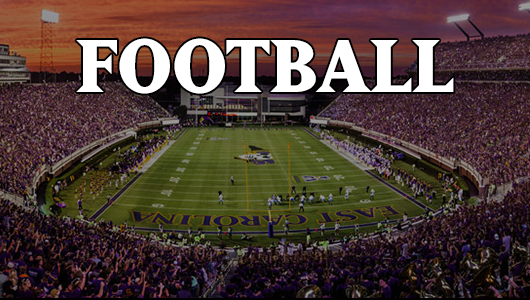 In one single, completely unprepared Saturday in October, what good will and hope that the previous four contests of the season showed signs of a future for ECU football, the curtain came up to expose that this team is totally capable of backward steps the likes unseen by many programs. My hope…my biggest need this season to keep on believing was to see indications that the team was bouncing up from rock bottom and starting to stabilize. By that, I mean, even an 0-12 record with all games being competitive would have brought some measure of relief. And through four games, it seemed that was so. The team could have easily been 4-0 (and just as easily been 1-3), but each game was competitive (save the UNC-CH game). But the Pirates regressed…exponentially on Saturday. Hungry for a win, we got…well…you see what we got. Most disappointing to me, is just how unprepared and dispassionate our team looked on the field. In a game that meant, quite literally, EVERYTHING to this team and program, the team on the field and the management of it looked completely shocked, stunned, and apathetic to what was happening. In defense of the defense, which had been a great surprise up till Saturday at 11:59 a.m., the Pirates offense was so bad, so ill-prepared, and executed the uninspired play-calling so poorly that the defense barely had time to breath before trotting back onto the field to face an opponent already in their territory. Short fields and no time to recover punched the defense out before they could even get out of their corner. But, even with that, the defensive game plan appeared a drastic change from four previous, strong outings. Up to this point, the corners were pressing up on the receivers and playing aggressive, physical defense and suddenly we are giving cushion to the likes of Temple? Our linebackers looked lost in coverage and the pass rush couldn’t get off because the Temple QB – one who struggled to complete passes up till Saturday – barely had to progress through his reads. First guy open, pass off in two seconds. “Pitch and catch all day” as the announcer kept saying. And then…unlike our first four games, NO ADJUSTMENTS that made any sense. WTF happened out there? Offensively…anemic. I felt like I was witnessing the JT years again (and honestly, there doesn’t seem to be much difference in the outcomes of this ECU staff than when JT was here). Everything we do is predictable and other teams are way ahead of us. Three weeks ago, while basking in the success of Holton Ahlers coming in to spark the running game, everyone that I talk to and everywhere I read from other fans, the assumption was that the ECU offensive playbook would open up for Ahlers so that his trotting out onto the field didn’t signal to the opponent that passing would be off the table. Nothing. No changes. Ahlers comes in, walk everyone into the box, stop the run. It’s like a police officer blaring the sirens en route to a covert bust. Why? It can be exhausting to be a Pirate fan. Given time, Herring can rip a D apart with his arm. However, once there is pressure coming into the equation, effectiveness all but evaporates. There were guys open for the Pirates quite a bit on Saturday, but we couldn’t find them. And, if the only route NFL-caliber Trevon Brown can run is the go route, then we are doing him a horrible disservice. While it’s probably the right call to open up the quarterback battle, which Coach Mo has done this week, the offensive failures, IMO, do not lie at Herring’s feet. Yes, he could have made some better decisions, but he is just five games into his college career as a starter, so when things aren’t working for a young QB, the offense has to have a Plan B to take the pressure off. Even if that is to force more safe passes on rhythm or move the pocket more or mix up the run game in a less obvious way. While Herring looked ill-equipped to handle the pressure, Ahlers has looked like he never passed the football before. We know neither is true, so there seems to be something else at play here. FUBAR…which is potentially one game removed from SNAFU. And, if that happens – meaning another Temple-like exhibition but this time at home at the hands of Houston, the Pirates financial woes may go from bad to worse as the seas of empty seats may start to expand into the old school diehards. Life’s just too short to keep pushing the red button and hope for a change of outcomes. I’ll tune it at kick-off…I owe that to my Alma Mater and to the kids who have the love and dedication enough to put on the Purple and Gold to be our proxies. They deserve the support. And, I suspect we will see a bit of a bounce back defensively…I believe in our DC. But to witness another massively unprepared team with no back-up plan, I can’t promise that I’ll make it to see the No Quarter flag unfurled. I find myself longing for a season with 7 or 8 wins against teams with losing records. On an up note, the Pirates Volleyball team is making history. Someone please chime in here and tell me that nothing is as bad as it seems. I’m afraid despair is the proper stance here. This is year 3 and we saw exactly what has exasperated fans for the previous 2. A look of hopeless confusion and lethargy by the team. Time to cut bait and start over yet again. Thanks for checking in Roger…misery meet company I guess. Completely agree with you Ron. This one of the worst losses of the Scottie era….and that’s saying something. It was devoid of any positives. Something us Pirate fans are usually good at finding in the wake of a loss. Regardless of what happens the rest of the season. It’s time for a new coach. Scottie is not working at ECU. I fear we’re years from becoming a competitive, respected program again. Ugggh. Hi Greg…extremely good to hear from you. Hope you and your family are doing well. Agree with your sentiments on the program. Sad days ahead and no one at the rudder to make changes it seems. I really miss the program when it was an upstart and fighting for recognition. The fans and alums deserve much better than this. It’s been obvious for a while that Scottie isn’t a head coach. However, with no AD, it’s hard to see how we can make a move.